If you’re having trouble signing into Xbox Live or joining matches in Titanfall, it’s not just you – it’s us too. Microsoft states that users are experiencing limited functionality with the service. An outage on most any other day wouldn’t be such a big deal, but it’s Titanfall day in Xbox Land, so this is the biggest deal. Larry Hryb, Microsoft’s Director of Programming, confirmed that Microsoft is aware of the issue and says specifically that “This is not a #Titanfall issue.” Not only is Respawn’s shooter affected, but Forza Motorsport 5 was listed as well just a few minutes ago, according to Joystiq. Rather than being related specifically to Titanfall, it speaks to a greater issue with Microsoft’s Azure cloud servers, the hardware that runs both games’ server-side content. While it isn’t an issue with Titanfall itself, it’s probably safe to say that the game is playing a large role in the downtime, between the millions of gigs of Titanfall downloads and the huge influx of players, the Xbox One servers and Azure especially are getting their first huge stress tests. Titanfall performed well in beta after an initial problem, so the game itself and its online functionality seem stable. We’ll be watching for updates, because we want to get in there and start blasting some mechs, too. 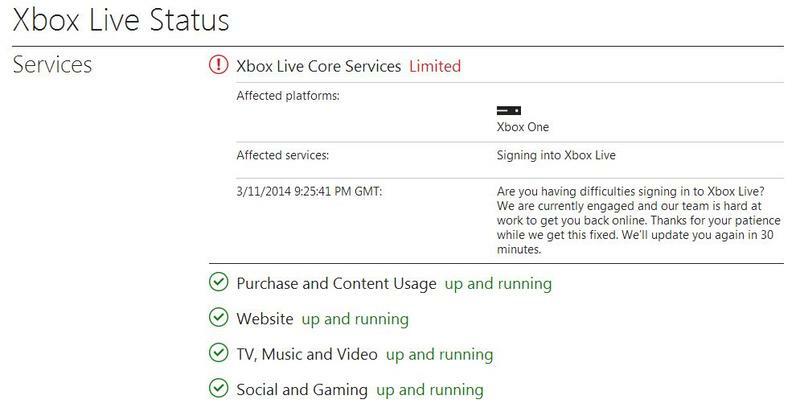 Were you experiencing issues signing in to Xbox Live? We are very happy to say that our team has fixed the problem and the Live service is ready and waiting. If you are experiencing any lingering issues, try a cold reboot of your Xbox by powering down, unplugging, waiting 10 seconds, plugging back in and powering back on. Thanks for all your patience while our team was working. Have fun!